Abstract: Sb-Au mineralization in the Mala Magura Mts. was found in the vicinity of the Chvojnica village. Mineralization occurs in quartz-carbonate veins and disseminated zones in the Variscan granitoids and highly-metamorphosed rocks. Paragenetic associations of Sb-Au mineralization are close to other deposits of this type in the Tatric tectonic unit (Male Karpaty Mts. Nizke Tatry Mts. etc.) The mineralization was formed during three stages. The pyrite-arsenopyrite-gold mineral stage is the oldest one. The arsenopyrite geothermometer gives a temperature range of 385–465 °C. Younger stages are the sphalerite-galena-tetrahedrite (2nd) and stibnite-sphalerite-sulphosalts (3rd) mineral stages. A substantial part of the sphalerite of the 2nd mineralization stage shows ”chalcopyrite disease”. Common association of pyrrhotite and native antimony observed in the 3rd mineralization stage indicates low aS2 and fO2 values of the ore-forming fluid. Furthermore, the 3rd mineralization stage comprises Fe-bearing minerals (jamesonite, pyrrhotite and berthierite), which indicate Fe-rich environment. Primary gold occurs in two generations differring in Ag content. Abstract: The carbon isotope composition of carbonate rocks spanning an approximately 1650 m thick interval ranging from Upper Carboniferous to Lower Triassic, together with pedogenic carbonate carbon and organic carbon isotope data of Middle Permian plant remains, were used to evaluate the carbon isotope evolution of the Late Paleozoic in the Western Tethys. The results indicate a “positive carbon isotope event” across the Carboniferous-Permian (C/P) boundary, a negative shift of δ13C values at the end of the Lower Permian, a positive δ13C excursion at the Middle Permian-Upper Permian transition and the well known worldwide perturbations of the carbon cycle at the end of the Permian marked by a prominent decrease of about 4 ‰ at the Permian-Triassic (P/Tr) boundary, followed by a gradual increase of δ13C values from the Lower Scythian to the Anisian. It is suggested that the shape of the δ13C curve records changes in the carbon cycle that reflecting variations in factors such as burial rate and oxidation of organic carbon due to sea-level oscillations, which could be slightly overprinted by local processes influencing carbon isotopic composition in particular sedimentary environments. However, the marked disturbances in the carbon cycle across the P/Tr boundary most probably resulted from a combination of factors such as an accelerated oxidation of organic carbon due to the terminal phase of the Upper Permian marine regression, in combination with volcanic activity and a possible expulsion of methane from stored hydrates, as well as from a crash in primary bioproductivity. 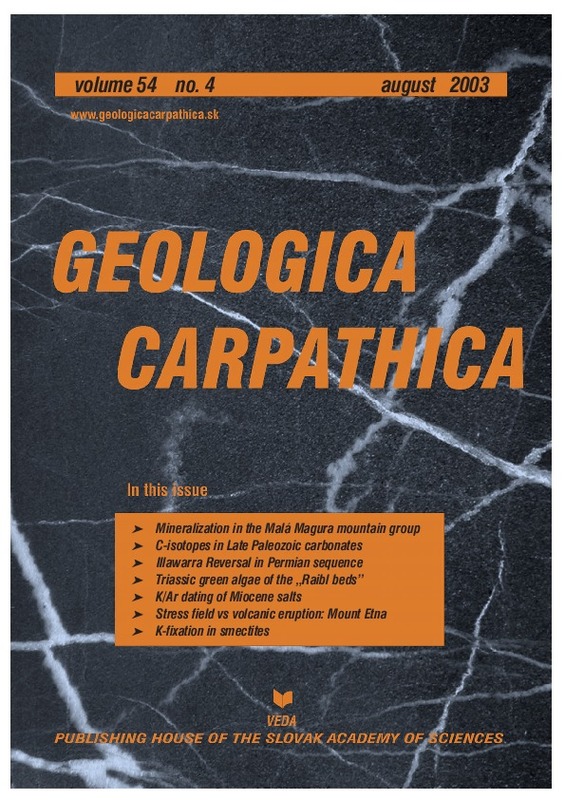 Abstract: The magnetostratigraphic investigation on the profile of the Upper Carboniferous-Permian belonging to the Hronic Nappe in the Nizke Tatry Mts. (Western Carpathians, central Slovakia) revealed occurrence of the first order time marker, the so-called Illawarra Reversal (265 Ma), within the 2nd megacycle of the Maluzina Fm. sequence. Abstract: The find of Clypeina besici from the "Raibl beds" of the western Karavanke Mts, Slovenia, provides supplementary information to the morphology of this Carnian dasyclad species. Segments of thalli (consisting of some tens of whorls), and numerous isolated whorls are preserved as singles, couples and triplets. Besides, two more dasyclad species that differ from C. besici are provisionally described with open nomenclature. Abstract: K/Ar dating of the potassium-magnesium sulphate minerals (langbeinite, polyhalite, and kainite) from Miocene evaporites of different stratigraphic formations and tectonic zones of the Carpathian Foredeep provides evidence that they have recrystallized at roughly the same time, and thus the ages of those minerals differ from the age of the hosting formations. The age of langbeinite from the Stebnyk mine (the host formation in Lower Miocene) indicates the recrystallization in the Middle Miocene (13.63–14.65 Ma), and the same age of langbeinite from the Kalush mine indicates that the host formation (the age of which is uncertain) is older than the Tyras “Suite” (which belongs to the NN6 Zone). The recrystallization was a response to three major tectonic events which affected the area: (1) beginning of the Carpathian nappe overthrusting in Ukraine (overthrust of the Outer Western Carpathians on the Carpathian Foredeep and of the Boryslav-Pokuttya and Sambir Zones on the Bilche-Volytsa Zone) and the related overheating, dated at 13.6–14.6 Ma; (2) final stage of overthrusting, origin of faults transverse to the Carpathian overthrust (11.4–12.6 Ma); (3) neotectonic movements and uplift (7.2–9.9 Ma). Thus, the evaporite minerals can be used to date the tectonic events in the regions of complex geological structure. Abstract: The eruption on 27 March 1998 at the NE Crater, from 21h22 to 23h59 GMT, with Strombolian explosions and lava fountains, was the first of a long series of eruptive manifestations with relatively high energy, which affected the volcano after the 1991–1993 lateral event. The seismic activity occurred late in 1997 and the first months of 1998 constitutes, in the authors’ opinion, a precursor of this eruption and the successive eruptive events at the SE Crater, since it is believed to be associated with a conspicuous magma uprise. The continuous epicentre migration, in a brief time span, in various sectors of the volcano owing to the dynamics of different tectonic trends, is considered related to a rapid fluctuation in the local stress field, probably responsible for the sudden onset and rapid end of the eruptive event. Abstract: Wetting and drying experiments performed at 60 °C were used to examine the effect of various concentrations of NaCl solutions on the degree of K-fixation. Cheto and Texas montmorillonites were used as a starting material for experiments. K-saturated samples were put through up to 100 cycles in 0.05–5 M NaCl solutions. The expandability values, measured by XRD peak position method, indicate a higher degree of K-fixation in the most diluted NaCl solution at a given number of cycles in comparison with smectites wet by distilled water. However, the effect of NaCl solutions of higher molarity on the degree of K-fixation is not straightforward. Smectites wet by moderately concentrated NaCl solutions approach the K-fixation pattern of water-wet smectites. K-fixation in the smectites in the most concentrated NaCl environment was clearly retarded. The effect of NaCl on K-fixation was much less visible when a buried altered volcanoclastic sample was used.